Place the eggs in a small saucepan and cover with water. Bring the water to the boil, then reduce to a simmer for 7 minutes. Remove the eggs and run them under cold water. Set aside. Meanwhile, slice the mushrooms and carrot, separate and rinse the bok choy, mince the garlic and grate the ginger. Heat the olive oil in a large saucepan over medium heat and add the mushrooms, carrot, garlic and ginger, cook for 2 minutes stirring occasionally. Pour over the stock and bring to boil, then reduce to simmer. After simmering for 5 minutes, add the noodles and bok choy and cook for a further 2 minutes. Peel the eggs and cut them in half. 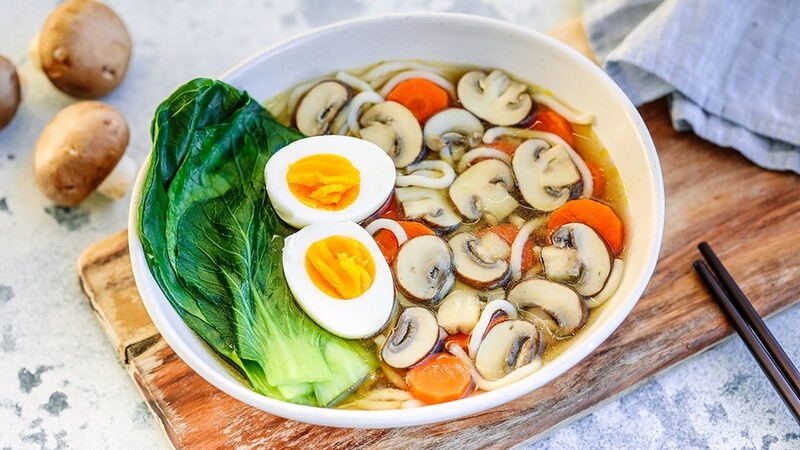 Divide evenly between two bowls and top each bowl of Mushroom Ramen with a boiled egg.